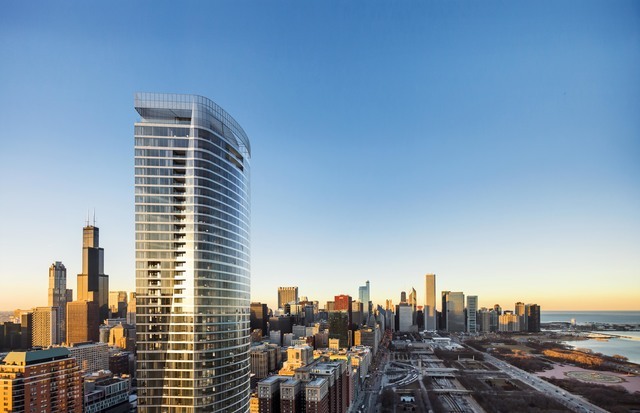 Come and see this incredible 2 bed, 2 bath corner unit in one of South Loop&apos;s finest buildings with rare south, west and east views of the lake! This home boasts a massive living room, open floor plan with upgraded kitchen counter tops, stainless steel appliances, 42-inch cabinets &amp; hardwood flooring &amp; much more. The master bedroom features a large walk-in closet and full bathroom with dual sinks, perfect for relaxing after a long day. This split floor plan allows for privacy when guests come to stay and also includes a den, perfect for an office. All closets have custom shelving. The building features renovated penthouse level amenities: indoor pool, fitness center, &amp; party room, 24-hour door staff, bike room, and additional storage. Can&apos;t beat the location! Walk out the door and you are steps to museum campus, Michigan Ave, dining, shopping, Grant Park, bike paths and much more! Allows for quick highway access near Lake Shore Drive. Deeded parking spot sold separately for 30k. Take a 3D Tour, CLICK on the 3D BUTTON &amp; Walk Around. Watch a Custom Drone Video Tour, Click on Video Button! Live the South Loop Life in this Stunning 2bed/2bath +Den Condo! This corner unit has it all. Take in lake &amp; skyline views from your walls of windows or enjoy them from your private balcony. Modern kitchen w/stainless steel appliances &amp; granite counters. Open living space is ideal for entertaining. Unit features 12 ft ceilings, Maple hardwood floors, &amp; new washer/dryer. Spacious Master w/Spa like ensuite bath that has double Quartz vanity, separate shower, &amp; large European tub. Fully enclosed second bedroom. Guest bath completely updated. Den area is perfect for an office, or extra living space! Garage Parking 35k extra! Building has healthy reserves, pet friendly, exercise room, &amp; storage! Easy walk to Grant Park, lakefront, Roosevelt CTA, Jewel, Dog Park, Millennium Park, Trader Joes, Target, restaurants, nightlife, &amp; everything South Loop has to offer! PARKING INCLUDED!! A one-of-a-kind gem in the South Loop with a balcony AND a green space. Located in the historic prairie district, 1 block from lakefront trails, soldier field, and dining galore. Rarely available 2 bdr/2 bath/den corner unit with split floor plan, skyline views from every window and 2 outdoor spaces, unique to this unit. A full balcony with loop and lake views, and a west-facing green terrace to watch fireworks and sunsets. Updated floors, custom doors ss appliances and massive closets(+private locker) for tons of storage. In addition, the building includes a RoofTop pool with clubhouse and full kitchen, sun deck with grills, exercise room, sauna &amp; 24hr doorman and temp - controlled garage. Beautifully upgraded east facing 2 bedroom/ 2 bath plus den/office WITH GARAGE PARKING INCLUDED in one of the South Loop&apos;s most popular buildings! Stunning panoramic views of Lake Michigan, Soldier Field and Museum Campus from every floor to ceiling window in the unit! This home features hardwood floors throughout, spacious kitchen cherry cabinets with additional glass front cabinets above the island, new backsplash, granite counters &amp; SS appliances. Spacious living room/dining room leads to a large 13x5 terrace. Master bath features a double bowl vanity with granite tops and a large walk in shower with multiple shower heads/rain shower. Newer front loading washer dryer, very large walk-in closet in master bedroom w/ custom closet built-ins &amp; window treatments. Full amenity building offers a 24hr doorman, indoor pool, indoor hot tub, fitness center and party room with stunning views! Beautiful southwest facing, 2 bedroom + den unit at Museum Park&apos;s Tower Residences. Open living area with hardwood floors, floor to ceiling windows and private balcony. Kitchen includes granite counters, double oven and has a large breakfast bar. Large master suite with nice closet space. Live in this full amenity building with 24 hour door staff, outdoor pool and sundeck, party room, fitness center and more! Excellent South Loop location- walk to the Lake, Grant Park and Museum Campus. Garage Parking is additional $35k.